Directions: Head south from Ponca through Boxley Valley. At the intersection of Hwy 43/Hwy 21, Turn Left/South onto Hwy 21, and go approx. 1.2 miles, past the old Boxley Church. 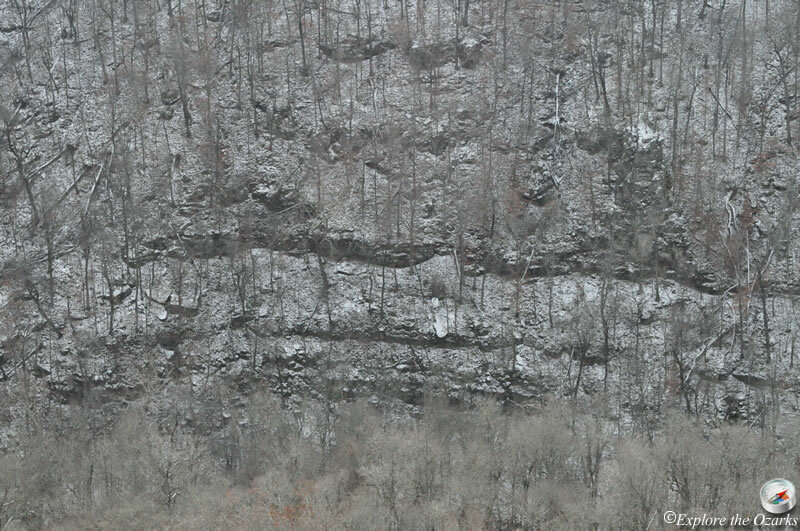 Just before a bridge over the Buffalo River, Turn Right onto Cave Mountain Rd./County Rd. 5 (dirt, unmarked). 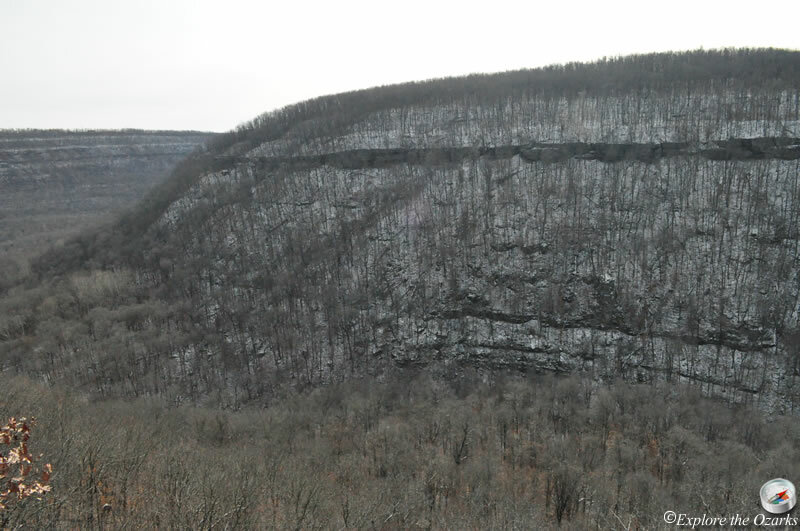 Follow this road as it steeply climbs up Cave Mtn and eventually levels out on top. At approx. 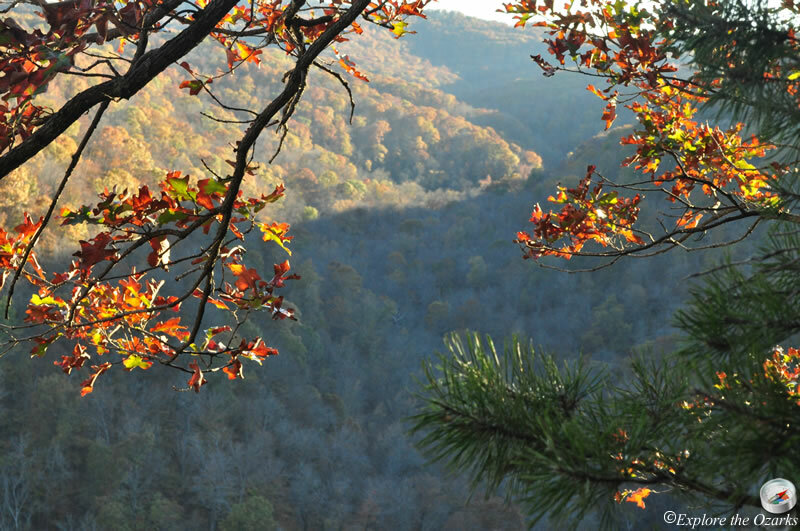 5.4 miles from the highway, you will pass Cave Mtn Church, continue Straight ahead until you reach the trailhead at 6.0 miles; the parking area will be your right. 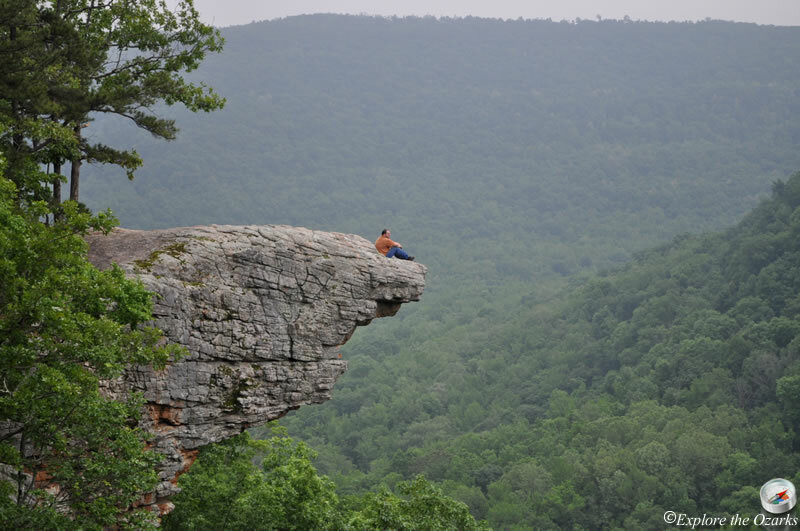 The Hawksbill Crag, also known as Whitaker Point, is located along the northern edge of the Upper Buffalo Wilderness in the Ozark National Forest, just south of the Buffalo National River. 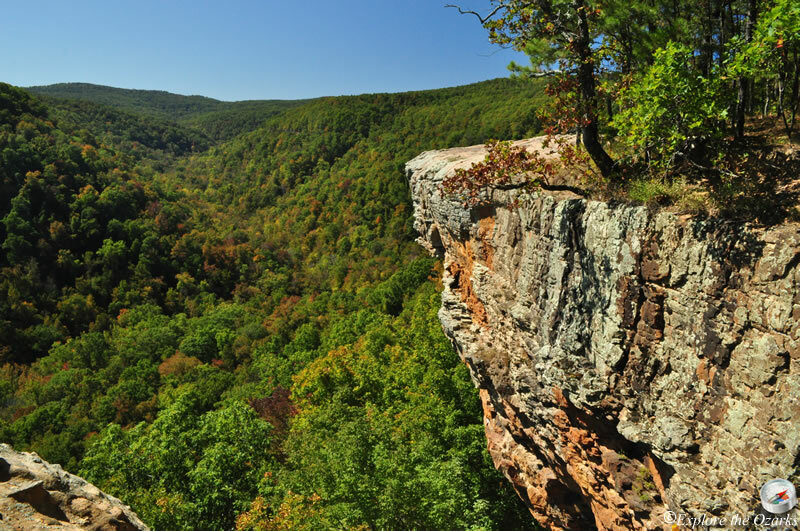 It is easily one of the most photograped and recognizable features in Arkansas, and is often seen on publications depicting the outdoors in Arkansas. 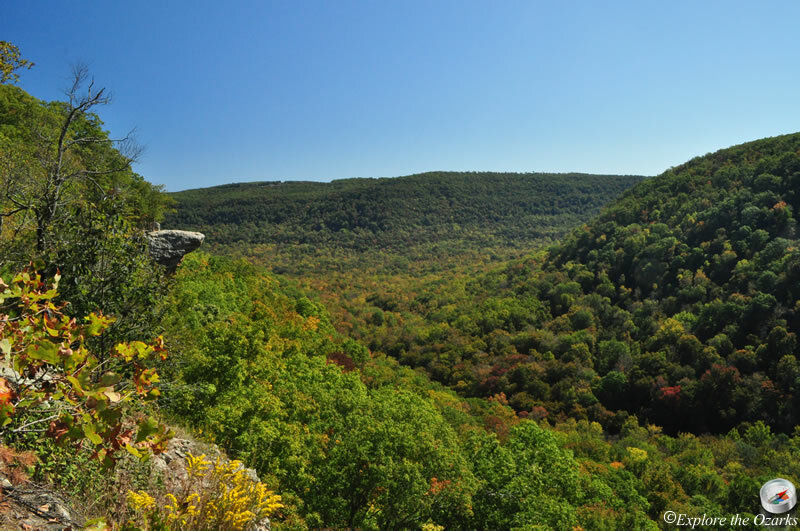 The hike to it is an easy 3.0 mile round trip, and offers scenic vistas, huge boulders, beautiful waterfalls and colorful wildflowers. From the parking area, the trail actually begins across the road, and is marked by a small monument commemorating senator Dale Bumpers for his efforst to help establish wilderness areas like this one in Arkansas. The trail quickly starts to drop on down a little as it travels through the woods, passes a registration sign, crosses a small drainage, then switchbacks downhill a little more. From here, it runs more level, crossing a few more small drainages as it slightly works it way downhill. 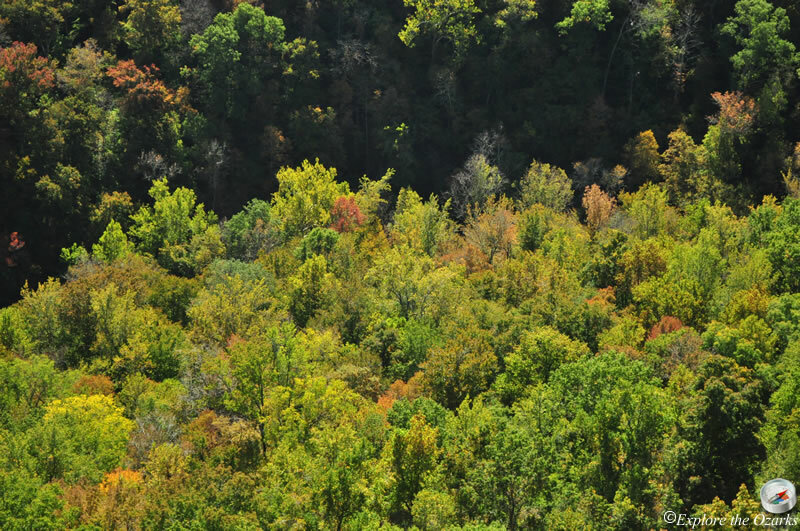 During leaf-off, you can start to see into the Whitaker Creek valley. At the 1.0 mile mark, the trail drops down into and crosses a small creek, then splits. 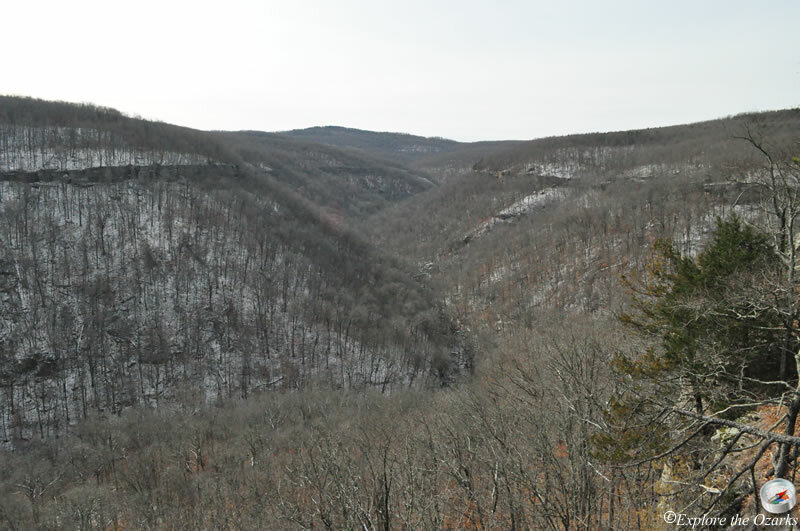 You can turn left and follow and old roadbed through the woods to the crag, or Turn Right and follow the small creek downstream a hundred yards to the edge of the bluffline. Here, during wet weather, you will find Haley Falls, named after a six year old girl who was lost here and later rescued during one of the largest search missions in Arkansas. At the bluffline and Haley Falls, the trail Turns Left and follows close along the bluffline. This section of the trail can be Very Dangerous as it hugs the bluff, so be sure to remain on the trail and away from the bluff! 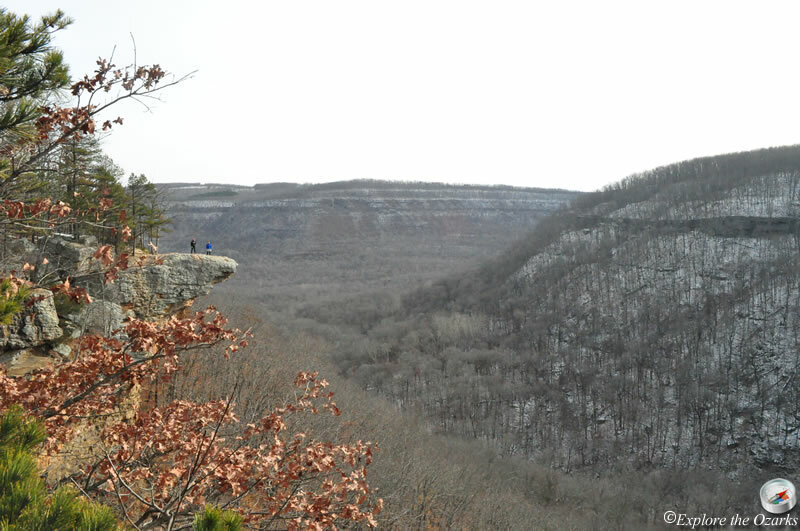 If you do venture out to the bluff and happen to fall, it could be deadly, so PLEASE USE CAUTION! As the trail continues along the bluff, you pass by and in between some huge boulders and other neat rock formations. After you clear this part of the trail, the bluffline and trail will start to swing around to the left, then all of a sudden, you will be able to see the crag! The trail continues ahead to access the crag, and the other trail that follows the old roadbed joins this trail just before you reach the crag to your left. Again, PLEASE BE VERY CAREFUL while out on the crag; if you slip and fall, it is over 100' drop to the bottom, and you probably will not survive. Spend some time while you are here and soak up the views. 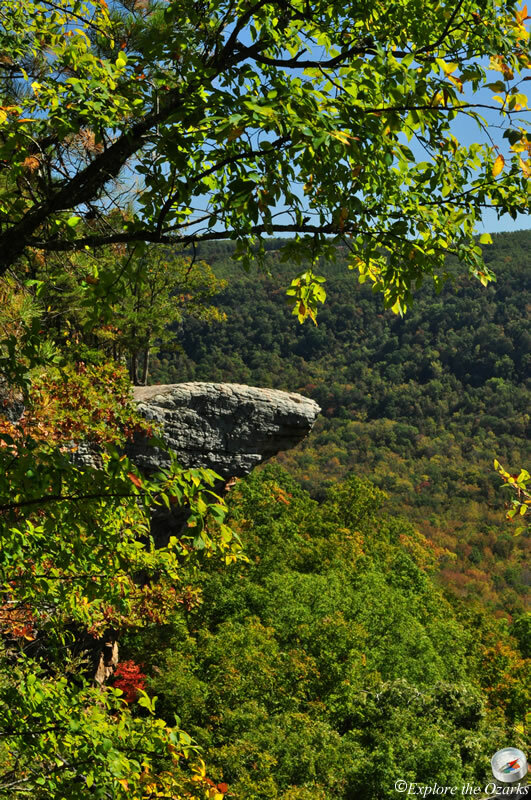 Just below you is the Whitaker Creek drainage, where Hawksbill Crag gets its original name from, Whitaker Point. To your right, you can see where Whitaker Creek drainage comes from the southwest. To your left is where Whitaker Creek joins the Buffalo River. If you have time while you are here, be sure to check out two other waterfalls in the area, Mule Trail Falls and Thousand Kisses Falls. To get back to the trailhead, simply turn around and head back the way you came. 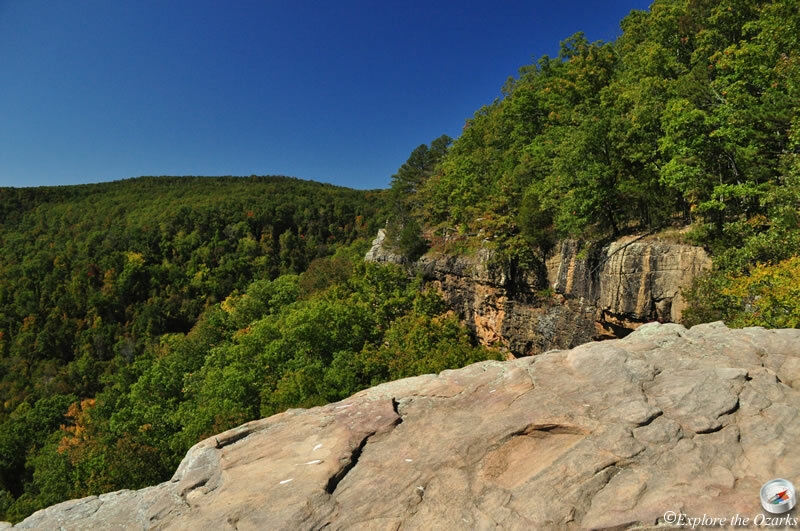 The trail DOES NOT continue past Hawksbill Crag, and dead ends at private property.